The process described above works best if the eye is a perfect sphere and the cornea is smooth and rounded. Often this isn't the case. The eye might be shorter or longer from front to back than it is from top to bottom, or the cornea's curvature might be slightly flattened. 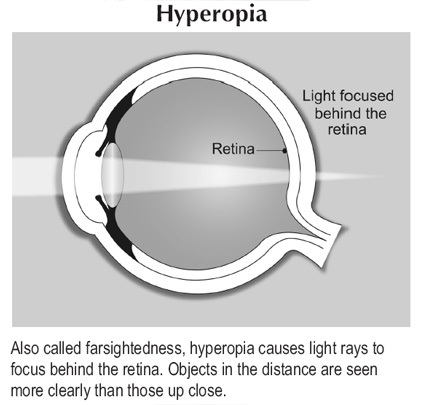 If your own eyes are shorter than normal from front to back, then you have hyperopia, or farsightedness, and you see distant objects more clearly than near ones. If the opposite is true-your eyes are too long from front to back-you have myopia, or nearsightedness, and you have trouble seeing distant objects. The cornea's curvature should be rounded, like the side of a basketball. If, instead, it's shaped more like the side of a football, it will produce two focal points instead of just one. 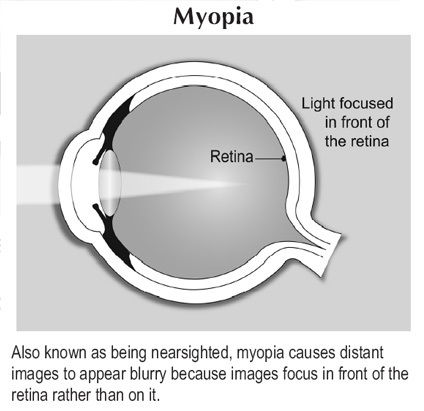 This condition is called 15 The Human Eye and How It Works Also known as being nearsighted, myopia causes distant images to appear blurry because images focus in front of the retina rather than on it. 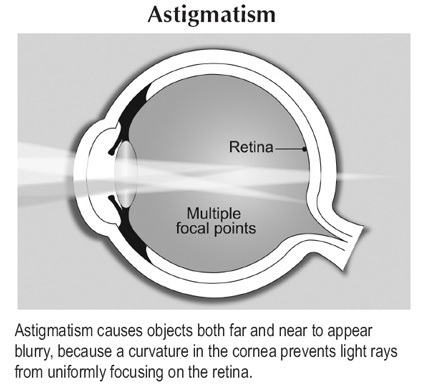 Myopia astigmatism and it causes blur and distortion, especially up close.